This wallplate features a unique blueish hue with a moon-like alabaster white center. When viewed from different angles it takes on the appearance of a cresting full moon. 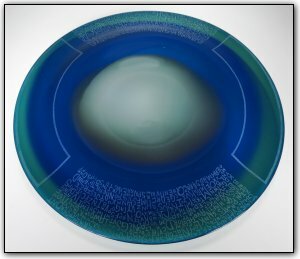 The artist has hand carved his signature defragmented poems into two sections of the plate. This process takes many hours to achieve such fine detail in a one of a kind pattern of lettering. This wallplate captures the mystical essence of the full moon rising in the sky. Wall plates can be hung on a wall just like a picture or they can also be set out as a table platter as well. To hang the bowl on a wall, all you need is a secure hook on the wall and a hanging apparatus comes along with the bowl. Hanging the bowl is a breeze and should take less than 10 minutes. You won't believe the compliments you are sure to receive when displaying this beautiful piece of wall art!